Milk Chocolate Almond Gift Box 1 lb. Our Milk Chocolate Almond Toffee in the Classic gift box with black bow is the original! 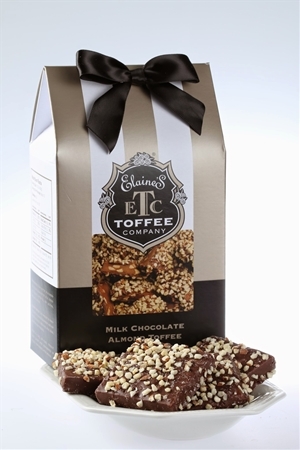 Almonds are added to our signature toffee mixture and toasted as the toffee cooks to the perfect temperature. After cooling, we cut the toffee into personal size pieces, enrobe it in creamy Guittard Milk Chocolate and top it with more crunchy almonds. This box makes the perfect hostess, teacher, or corporate client gift!